Talbot begins his work on fixing the broken Vongola rings. Tsuna, Ryohei, and Gokudera are still in shock of their assault. Talbot comes in with the Vongola rings in stone form and immediately, everyone believes that the upgrade had failed; however the upgrading begins when the Vongola Tenth Generation Family’s resolution is put to the test. Then, Tsuna, Ryohei, Gokudera, and Hibari begin the assessment of their resolution. The rock forms of the rings are in flames but it’s still not enough. Reborn saying, ‘Your family is waiting.’ has their flames burn even hotter, brighter, and fiercer allowing the upgrade to be successfully complete. Wow, is all I can say right now. 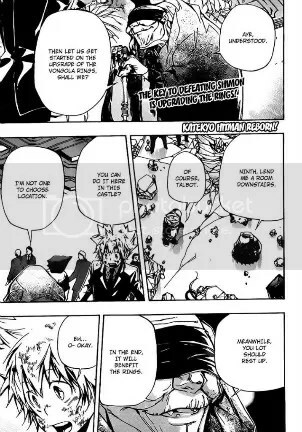 The story is getting more intense as Vongola is getting more powerful than ever but to only face an enemy that completely overwhelmed them and rendered them powerless. Talbot asks, ‘ Primo, the enemy is Shimon. How do you feel?’ This line is simple yet may contain importance. Could Talbot really have lived during the times of Primo?– could be possible in this manga. The new forms of their rings are amazing with lots of detail and cool looking. I can’t wait to see what the other members’ new Vongola ring form.